The perfect size for smaller gardens. It forms a bushy upright mound of coarse dark-green leaves, bearing large umbrella-like heads of magenta-pink flowers in late summer. A magnet to butterflies, suitable for planting in moist to wet areas. 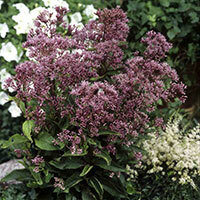 The stature of this selection is ideal as a focal point in a large container or tub. Dried seedheads offer good winter interest, so consider leaving them until early spring. Flowers are terrific for cutting. This relatively compact selection offers up all kinds of garden uses, including borders and even in large containers. 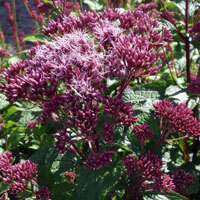 It bears big clusters of rosy-purple flowers in late summer, over a mound of coarse green leaves. A magnet to butterflies. Excellent for cutting. Best with plenty of moisture. Gigantic domed clusters of small purple-pink flowers are held on tall, self-supporting red stems with lance-shaped, bright green leaves from July to September. 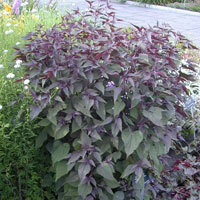 This majestic perennial will give height and drama to a moist border, wildlife or bog garden in sun or partial shade. It needs space to spread and will self-seed freely. It’s a nice short with a busy habit. Plant very branched and flowers abundantly. Solid and not blowing. Red Dwarf falls under trademark law. Superb architectural perennial with huge heads of dark pink-purple flowers in late summer held above strong burgundy stems. 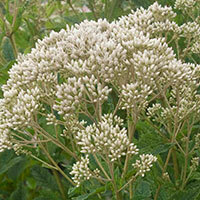 Perfect for the back of a border, it is a magnet for butterflies, and the fluffy seedheads look good well into winter. 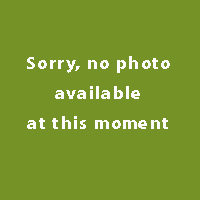 A little-known species related to the tall Joe-Pye Weed, native to large areas of eastern North America. This outstanding selection has dark bronzy-brown leaves in spring and summer, gradually turning green when the autumn display of fuzzy white flower clusters begins. Useful in shady situations and will even tolerate dry shade under deciduous trees once plants are established. Both the foliage and flowers are useful for cutting. Attractive to butterflies. Clumps may be easily divided in early spring.